While PS/A provides many services for our clients, video has always been one of the most interesting ones. From a golf course with Jack Nicklaus to the inside of a nuclear power plant to surgery suites, it’s a medium that allows for creativity while carrying the message. In over nearly half a century of production work, we’ve completed a lot of projects, and putting them all here would be impossible – plus, a lot of what we do is proprietary to the client so, we’re limited in what we can show. These will give a sample of some of our recent projects and the creative and technical ability of our editors in reaching the audience as the client intended. Each project is unique and the final outcome is based on the client’s input, desires and approval. See our other services HERE. HEAD Sports had their largest product launch in five years. They had two needs. 1) Create a video for their 3,500+ North American dealers that would excite them about new products and introduce them to those products with valuable information. And 2) place the video on a secure access server to allow, and log, viewership of the proprietary information for a specific amount of time. As part of our services… We accomplished both. From the entire 20 minute video, this is the open/close we’re permitted to show. HEAD Sports needed to highlight their new product line. To do that they wanted to use their spokesman – the #1 men’s tennis champion in the world, Novak Djokovic. PS/A was asked to produce the video to be used for promoting him in this element… on the court winning! This is the version we developed that was used to promote their product worldwide and we thank them for their confidence in promoting their new product line. Stilo is a large real estate development firm located in Milan Italy. They’ve been involved with many high profile projects around the world. When considering their project in Arizona and how to inform potential development partners, they needed something unique. Something that told the story but included many facets not easily put on paper. PS/A got the call to produce their video highlighting tourism around the world, the Grand Canyon area and the future “look” of the development itself. They’ve received rave reviews for their production. As part of a project for Homeland Security and our int’l client, ATMI, high pressure volatile gasses became a concern. So, shooting them with .50 cal rifles at 17,000 frames per second seemed like a natural. Something that was warranted with the shooting in Las Vegas recently where large pressurized gas tanks became a target. Watching the effect of ATMI’s better system for gas storage was a qualified success in response to specific threats. PS/A’s use of the Phantom camera to capture the shooting and explosions told the story as intended. Drone footage can be an important part of many various productions. It’s perfect for overview of housing developments, industrial parks, municipalities, landscaping projects, golf courses, resorts and manufacturing facilities. Our FCC licensed pilot has the highest rating possible to allow for maximum use and offer premium coverage of your project – both in high definition video and still photography. Materials used in semiconductor manufacturing are highly corrosive and volatile. Our client wanted to introduce their newest packaging and of course, once again called on one of their long time partners, Production Services / AZ for our slow motion camera work. Volatile liquids in manufacturing plants are a safety concern so their high-tec new package needed a creative direction to tell the story. Our international biosciences client, ATMI, has developed some innovative electronics recovery techniques. We first produced this in English (Original HERE) and then for their overseas counterparts they requested it in Japanese and then Chinese below. PS/A produced the original and then did the translation into Chinese, chose the voiceover talent and did a final production of the entire project. PS/A handles translations into and out of over 80 languages. 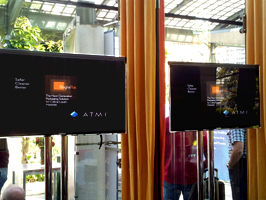 Our international client, ATMI, developed some innovative electronics recovery techniques. We first produced this in English (Original HERE) and This is a redo of our english and Japanese high tech video only this time done in Chinese for our client’s foreign counterparts. Translation services (in over 80 languages) is just part of our production capabilities for video and print. For a variety of projects (video & photography), the latest drone technology can make a lot of sense. For real estate, golf courses, manufacturing, or construction, our fully licensed FAA pilot is available to make you and your project look good. It’s one more production element that adds value to our project. This was a private event venue that needed to highlight their proximity to hiking trails and the mountain views along with views of the city. One of our valued production partners asked us to create a marketing video for them to reach more customers. We enjoy some great working partnerships that expand all our capabilities and ensures a quality product for our mutual clients. It was our pleasure to work with them on this project. We’d like to do the same for you. Framatome is the US based arm of the world’s largest nuclear company located in France. They have built the majority of nuclear plants in the world and they power 85% of Frances’ power grid. In this country they train personnel to inspect and repair such facilities as California’s San Onofre and Arizona’s Palo Verde plants. Palo Verde is the nation’s largest nuclear power facility and is shown in this video for Framatome and APS. Much of their training and information is proprietary but this is a generic section we’re allowed to exhibit. When Primus needed to introduce their new drug to the Washington elite including government authorities, PS/A got the assignment of telling the story. Some of this is very detailed and in-depth, but it’s for a regulatory audience. The opening and parts will give the creative direction we chose. PS/A was also chosen to produce their sales training videos. When a new company needs to put out its message, there’s a lot of real information to be presented. Not just sales hype, but facts and supporting elements that make their product stand out. Such was the case for this new bottled water company. Their product is the purest, the cleanest, the healthiest to be found and they have a great future. To make their presentation a bit more unique, we again went to our voice of MythBusters to add his own timbre to the piece. In discussions with a major lifestyle TV network, PS/A was asked to develop an open for a Southwest Living show. We took to the streets and deserts of Arizona, and with the aid of our great spokesman Lisa, we produced this sample for them. Episodic TV can be a lot of fun, but takes a lot of work and people to pull off a weekly show. The same energy can be applied to regular video updates for companies looking to communicate with customers and employees.